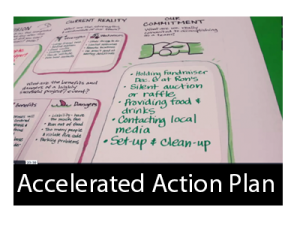 Prepare for Accelerated Action Planning by downloading this package for FREE. Includes video guidance and template to use with your team. To begin, first download the Project Scoping Template by clicking the link below. We recommend printing the template and having it enlarged at a copy or office facility to use during your meeting. Then watch this Project Scoping video with your team. Once you and your team have completed the Project Scoping Process, download the Accelerated Action Plan Package to gain access to the full 23 minute video that includes everything you need to complete your project plan. The process you learn there will be invaluable for executing the plan you scoped in the exercise above. In addition to the video, you will also want to download the four .PDF templates that are included in this package and have them enlarged for use in your meeting.